Could New Dwarf Galaxies Be The Key to Understanding Dark Matter? 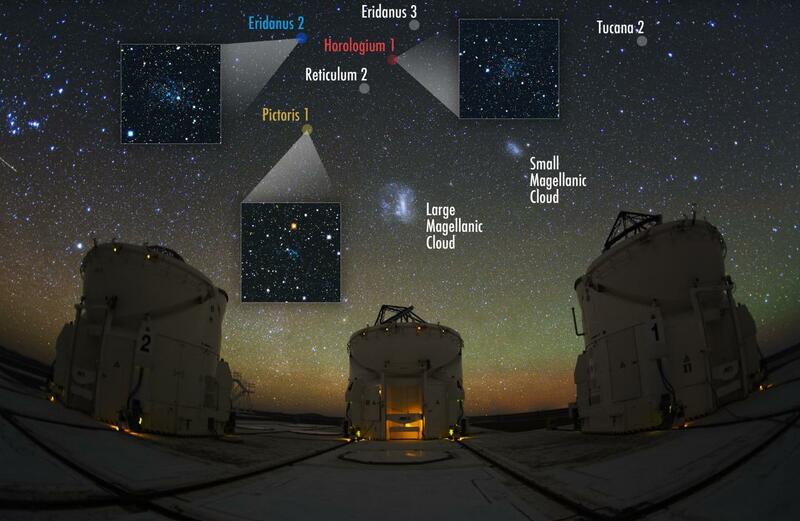 Six of the nine newly discovered possible dwarf galaxies shown in the sky above the Auxiliary Telescopes at the Paranal Observatory in the Atacama Desert in Chile. In a new study, astronomers at the University of Cambridge discovered nine new possible dwarf galaxies within close proximity to the Milky Way. These new dwarf galaxies, the first to be identified in over a decade, could be instrumental in helping scientists better understand dark matter. "The discovery of so many satellites in such a small area of the sky was completely unexpected," remarked lead author Dr. Sergey Koposov of Cambridge's Institute of Astronomy. "I could not believe my eyes." While dark matter comprises only 25% of the universe as a whole, dwarf galaxies contain up to 99% dark matter, making them an ideal sandbox for dark matter experimentation, says Dr. Vasily Belokurov. Of the nine objects identified, three have been confirmed as dwarf galaxies. The remaining six could possibly be globular clusters, which are constructed similarly to dwarf galaxies but are not held together by dark matter. The Cambridge team used publicly released data from the Dark Energy Survey, a multinational consortium of universities and research institutions.